Unfortunately, the life you walk away from doesn't always let you walk away. It's been awhile since I've read a really good, really funny Brit chick lit novel. Bella Summer Takes a Chance by Michele Gorman had me laughing out loud numerous times and was a great read. Bella Summer has been having a tough go of things. I think that makes her seem quite real. Her life is far from perfect but I was immediately invested in her story. I knew she was trying to change her life for the better and I couldn't wait to see how it would turn out. What makes this book stand out a little bit more than your average chick lit is that Bella, or B. as she likes to be known, is slightly older than your average heroine. This lends her a more mature view on life which was a refreshing change. The only teeny little issue I had was actually with the epilogue. I’m all for happy endings and knowing exactly what each character is up for but I think I've realized that I don’t need it spelled out for me, as Gorman did with the epilogue in Bella Summer. Each character's lives were wrapped up and you knew just what was happening with them. I mean, it was nice, but I would have been happy with the book ending after the final chapter and leaving off the epilogue. Kind of weird, I know! There were a lot of hilarious scenes in this novel and I was constantly laughing out loud. B. gets herself into some interesting scenarios. There was one particular scene that amused me when she had to inform someone she was, in fact, Canadian, not American as he’d assumed. He was jokingly fearful that she would sic a moose on him. To make this novel even more fun, B. has an amazing group of friends who add even more comedy, and heart, to the story. 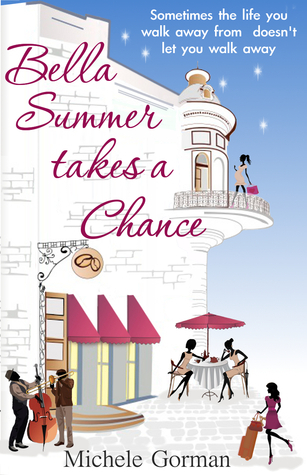 I still can't believe that Bella Summer Takes a Chance is the first novel by Michele Gorman that I've ever read. I thoroughly enjoyed reading it and plan on checking out all of her other novels as well.